Agenda Available -- Register Today! This is a reminder to register today for the Social Security Advisory Board’s Policy Forum on the Supplemental Security Income (SSI) Program, which will feature speakers from Capitol Hill, SSA, and academia (among others). The event will occur on Tuesday, July 12th at the Carnegie Library - Mount Vernon Square, 801 K Street NW, Washington DC. We hope you will come to share your ideas as we explore important policy issues in the SSI program. The agenda and speaker bios can be found here. Highlights include discussions of the SSI rules on assets and in-kind support, the outcomes for children transitioning from SSI and how current discussions of poverty policy might impact the program in the future. We hope you will join us from 8:00 AM to 4:15 PM on the 12th. Register now and let us know any reasonable accommodations you may need. Space is limited, so registration is required for either the morning, the afternoon, or the full day. You need to be an AEA member to access these papers, but often you can find without a paywall through Google Scholar. contributions are based on their employees’ savings preferences. Social Security’s 75-year deficit is 2.66 percent of payroll, just a hair below the 2015 projection. The deficit as a percentage of GDP remains at about 1 percent. It reallocated payroll taxes to extend the life of the DI trust fund. It helpfully eliminated claiming loopholes, which had a small positive effect on program finances. The brief is available here. Read more! The Bipartisan Policy Center’s Securing Our Financial Future offers a new set of recommendations to strengthen Americans’ retirement income security. The full report can be found here and an executive summary here. A useful compendium of graphical information about the recommendations can be found here, and an affecting video on the financial challenges facing Americans can be viewed here. The report was developed by the BPC’s 19-member Commission on Retirement Security and Personal Savings, co-chaired by former Senator Kent Conrad (D-ND) and Jim Lockhart, former principal deputy commissioner of the Social Security Administration (SSA). I served as one of the commission members and was deeply impressed by the co-chairs’ leadership and process acumen, as well as by the other commission members and an exceptionally capable team of staff. As the commission included experts holding a wide range of policy views, a consensus report was only possible because its work was relentlessly data-driven, and because the co-chairs skillfully incorporated input from the entire commission to forge balanced compromise. It is fashionable in political circles to characterize genuine compromise as containing something for everyone to dislike; a more accurate description in this case is that compromise would lead to far better results than either left or right would receive under the status quo. Click here to read Blahous’s whole article. And click here to download the BPC report. Biggs: What Happened In The 2016 Social Security Trustees Report? Specifically, progressives charge that Public Trustee Charles Blahous brought bias to his position, due to his past work as a staffer for President Bush and his current position at a right-leaning think tank. Blahous served one term as a Public Trustees and has been nominated by President Obama for a second term. However, due to progressive opposition his confirmation was delayed. That means that the 2016 Trustees Report was published without the input of either Blahous or the second public Trustee, Robert Reischauer of the Urban Institute, whose nomination also was delayed. But guess what? Almost nothing of substance changed. The Report still shows a wide funding gap for the program and no major assumptions leading to that conclusion were changed in Blahous’s absence. What this tells me is that the Trustees Report doesn’t show a dire financing picture for Social Security because of Blahous’s nefarious influence. It shows a dire financing picture for Social Security because that’s what the program actually faces. Dean Baker of the Center for Economic Policy and Research released a statement following the publication of the 2016 Social Security Trustees Report. As (almost) always, I don’t agree with all of it, but Dean always has something different and interesting to say. "The 2016 Social Security Trustees Report is little changed from the 2015 Report. It shows a small decrease in the projected 75-year shortfall of 0.02 percentage points. Changes in the disability program, along with small changes in projections more than offset the increase of 0.6 percentage points due to shifting the projection period by a year. (The new projection adds 2090, a year with a large projected deficit, and loses 2015, a year with a surplus.) While reporters and politicians routinely focus on the projected shortfall, what will matter far more to the people covered by Social Security is the projected growth in real wages and their distribution. As has been pointed out, almost 40 percent of the projected shortfall in the program is attributable to the upward redistribution of income over the last four decades. This has pushed a larger share of wage income over the taxable maximum. For this reason, the finances of the program are directly affected by the distribution of income. "More importantly, the growth in real wages will have an enormous impact on future living standards, since the vast majority of the working-age population receives the overwhelming majority of their income from their work. The extent to which projected gains in productivity are seen in wages and compensation will have much more impact on workers’ living standards than any plausible increase in the Social Security tax. I can’t say I agree with Nancy Altman’s read on the 2016 Social Security Trustees Report, but we need to know what everyone thinks. The Social Security Board of Trustees has just released its annual report to Congress. It shows that Social Security has a large and growing surplus, and its future cost is fully affordable. Indeed, a greatly expanded Social Security is fully affordable. According to the new report, Social Security is 100 percent funded for the next eighteen years. It is 95 percent funded for the next 25 years. It is 87 percent funded for the next fifty years. And 84 percent funded for the next three-quarters of a century. The projected shortfall over the next three-quarters of a century amounts to just 0.95 percent of the nation’s Gross Domestic Product (GDP). In contrast, military spending after the 9/11 terrorist attack increased 1.1 percent of GDP virtually overnight. Spending on public education nationwide went up 2.8 percent of GDP between 1950 and 1975, when the baby boom generation showed up as school children. The fact is that, as the richest nation in the world at the richest point in our history, not only can we afford the current levels of Social Security protections, we can afford to greatly expand Social Security. Last year, Social Security cost just 5 percent of the nation’s Gross Domestic Product (GDP.) At its most expensive, at the end of the 21st century, the cost is projected to be just 6.1 percent of GDP. That is considerably less, as a percentage of GDP, than Germany, France, Japan, Austria and most other industrialized countries spend on their counterpart programs today. The Senate Committee on Health, Education, Labor and Pensions (HELP) held a hearing on Multiple Employer Defined Contribution retirement plans, which allow small businesses to jointly establish 401(k)-style retirement accounts. Multiple Employer plans are designed to reduce the fixed costs, regulatory burdens and fiduciary risks that prevent many small businesses from offering retirement plans. Click here to read the testimony and view the hearing video. The Committee for a Responsible Federal Budget argues that policymakers should think about the opportunity costs of expanding Social Security – that is, all the other things they could do with the trillions of dollars required for a broad expansion of Social Security benefits. Targeted benefit enhancements for Social Security recipients who need them most certainly should be considered in the context of a reform plan, and indeed they have been included in a number of bipartisan plans put forward in recent years. But before advocating for broad expansions that would increase overall costs, policymakers must recognize that both costs and benefits are already growing rapidly. As recently as 2008, the program's costs consumed only 11.6 percent of payroll, well below the nearly 13 percent raised by the payroll tax and other sources. By 2035, that cost will grow to 16.6 percent according to the Social Security Trustees and almost 19 percent according to the Congressional Budget Office (CBO). Both the number of beneficiaries and benefit levels (as we discuss below) will grow significantly over time. In light of the benefit growth under current law – which greatly outpaces the growth in available revenue – it is far from clear that further net increases are a wise use of scarce dollars, particularly since broad-based expansions can be quite costly. Democratic presidential candidate Senator Bernie Sanders's (I-VT) Social Security benefit expansions, as one example, would cost 1.3 to 1.4 percent of payroll once fully phased in, the equivalent of at least $1.2 trillion over ten years. For that cost, it would be possible to fully repeal the non-defense sequester, make college debt-free, double National Institutes of Health research funding, make community college free, establish universal pre-K, and fully fund the Highway Trust Fund. Maya MacGuineas of the Committee for a Responsible Federal Budget writes about two social security reform plans – one of which is mine, published by the American Enterprise Institute – that would reduce poverty in old age. Recent conversations about Social Security have evolved from how best to make the program solvent to whether benefits should be expanded for all future seniors. U.S. median senior income is among the highest in the world, while economic security for many families and public investment are falling behind. Given that, and with Social Security on the brink of insolvency, increasing benefits for middle- and high-income seniors would not be at the top of many people’s lists. There are, however, ways to reduce senior poverty without broad-based benefit expansions. Two recent Social Security proposals-–one from experts at the American Enterprise Institute; the other from the Commission on Retirement Security and Personal Savings at the Bipartisan Policy Center-–suggest doing just that. These plans are quite different. But both would make Social Security solvent and enhance retirement security for those who depend most on the program while increasing retirement income for the bottom 30% or so of earners and reducing senior poverty. The Bipartisan Policy Center plan would reduce senior poverty by about a third; the AEI plan would virtually eliminate senior poverty. Both would do so without relying on massive and politically unviable tax increases that would crowd out revenue for other national priorities. Social Security has been running a deficit since 2010, and in 2034, its “trust fund”—more or less just a tally of previous surpluses—will run out. Left and right could not disagree more about how to handle the situation. Democrats, up to and including Hillary Clinton and Barack Obama, would like to expand the program, necessitating tax hikes above and beyond what would be needed merely to sustain it. And conservative intellectuals, whose thinking is captured in a new report from the American Enterprise Institute, would like to gut the program and replace it with a flat benefit that does nothing more than ensure seniors don’t live in poverty. That’s something the current program doesn’t achieve, so low-income seniors would see bigger checks—but on balance, this would slash benefits so dramatically that the program would eventually run a surplus, allowing tax cuts. The left’s approach is grossly irresponsible. There is no compelling evidence that seniors, as a whole, need more benefits from the government—and in our current fiscal situation, they certainly shouldn’t be at the front of the line. But while the AEI plan has much to recommend it, it has zero chance of winning the support of the American people. The most likely and practical approach, alas, is the one Washington insiders have bandied about for years: A gentle mix of revenue and benefit tweaks to make the program sustainable. Click here to read Verbruggen’s whole article – well worth reading. The Social Security annual report, released today, shows that while the projected insolvency date for the combined Old Age, Survivor, and Disability Insurance (OASDI) trust funds remains unchanged at 2034, another year has been lost to inaction. The Obama administration trustees have called for legislators to address the shortfall "as soon as possible." The insolvency date for the overall program has not changed from last year, that is, it is now one year closer. With every year that passes, without fundamental reform, we are losing opportunities to responsibly put the program on a sound financial footing and for it to reflect the profound economic changes that have taken place since the program was last reformed in 1983. The unfunded obligation of the program, whether calculated over 75 years or over an even longer horizon, increased more this year than was expected. This is due to a realistic lowering by the Trustees of the future interest rate assumed. Further changes to reflect the best informed views on current and projected economic and demographic conditions, including for future mortality trends—in particular to better consider recommendations by the 2015 technical panel of external experts—no doubt are waiting on the participation of Public Trustees, whose positions are currently vacant. It is unrealistic to simultaneously "ensure solvency for future generations of Americans" while at the same time to "expand and finance improved Social Security benefits" as the Administration is recommending. I fear the lack of change in the depletion date for Social Security’s combined trust funds will give lawmakers and the public a false sense that the program’s financial problems are less than urgent—that reform can continue to be put off. Such a misunderstanding would lead to grave consequences for beneficiaries of both the disability and retirement programs. Although this report suffered from the lack of oversight by public trustees, it is notable that the administration trustees see the looming problem essentially unchanged. The recent last-minute patch of the financial problems of the DI trust fund should be a wake-up call for those concerned with the OASI retirement trust fund—delaying meaningful reforms only limits the options available. To schedule an interview, please contact: Camille Walsh at (504) 338-8785 or cwalsh@mercatus.gmu.edu. The failure to save enough—or save at all—has an impact on Americans in their working years and later in life. With life expectancy on the rise, workers’ efforts to prepare for retirement face threats from inadequate investment returns, large or unexpected expenses, and inflation. These risks affect all Americans, but those who have saved for retirement have a real advantage. Government can play a role in helping Americans save for retirement. Policy tools range from offering incentives, such as tax breaks for contributions or for setting up a plan, to providing consumer protections for retirement plan participants. Congress and the Obama administration have proposed approaches to increase retirement savings, but no major federal legislation has passed on this issue since 2006.3 That inaction has led state policymakers to look for opportunities to fill the gap. Concern about income inequality has dramatically shifted public attitudes toward economic and fiscal policy, and the subject of inequality has increasingly dominated the political debate. In fact, President Obama called inequality “the defining challenge of our time.” But the discussion has focused almost exclusively on comparing the earnings of lower- and higher-paid workers, and on promoting redistributive policies aimed at “correcting” this disparity. This focus has been fueled by the works of economists such as Thomas Piketty. New research finds, however, that both scholars and politicians have largely overlooked a key contributor to earnings inequality: the role of rapidly increasing healthcare costs. A new study from the Mercatus Center at George Mason University analyzes the link between earnings inequality and rising healthcare costs using unpublished data from the Bureau of Labor Statistics. The study finds that the increasing cost of employer-provided healthcare benefits accounts for a significant portion of rising earnings inequality. The study urges policymakers interested in addressing earnings inequality to shift their focus from failed redistributive policies to policies aimed at lowering the cost of healthcare benefits. WASHINGTON – Today, Congressman French Hill (AR-02) introduced the “Social Security Disability Insurance (SSDI) Return to Work Act.” The bill will reform SSDI by modernizing the Social Security Administration’s (SSA) classification of disability beneficiaries and incentivizing returning to work for beneficiaries who have recovered. According to the Congressional Research Service, many disability insurance beneficiaries will never re-enter the workforce, and, in 2013, only 0.4 percent of all beneficiaries were removed from disability rolls due to employment. Between 1981 and 2013, the employment rate among working-age individuals with work-limiting disabilities fell nearly in half, from 24.4 percent to 14.4 percent. Senator Tom Cotton (AR) and Senator Mike Lee (UT) introduced mirror legislation in the Senate today. “I am pleased to join Senators Cotton and Lee on this important legislation that will give the Social Security Administration better guidelines to apply an efficient, consistent, and accurate disability determination. Too many of our federal programs are using outdated metrics to determine eligibility. We need to continue our work in reforming and evolving these programs so that they can remain available for those who rely on them,” said Hill. The Social Security Trustees will release their annual report on Wednesday, June 22 at 10:30 a.m. Eastern time. I wanted to make sure that you were aware of two recent developments related to the work put forth by the McCrery-Pomeroy SSDI Solutions Initiative. Last week Senators Cotton (R-AR) and Lee (R-UT) announced legislation aimed at improving and prolonging the life of the SSDI program based on the recommendations put forth by Kim Hildred, Pamela Mazerski, Harold Krent, and Jennifer Christian in the recently published SSDI Solutions: Ideas to Strengthen the Social Security Disability Insurance Program. This legislation, among other things, would expand Continuing Disability Reviews (CDRs), change the benefit structure for medical improvement expected and medical improvement likely recipients, and establish a demonstration project to encourage work and allow for increased earnings for time-limited beneficiaries. You can read more about the legislation here and see our analysis and commentary here. The SSDI Solutions Initiative chapter this legislation is based on is available in its entirety here. 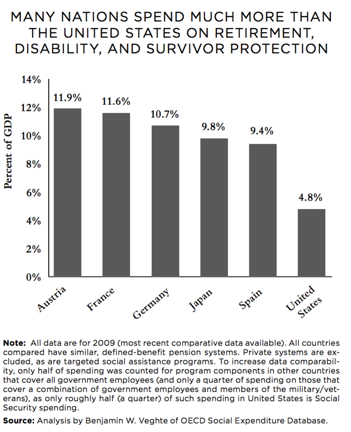 In another development, authors Yonatan Ben-Shalom, David Mann, and David Stapleton of the Mathematica Policy Research Center for Studying Disability Policy recently published a policy brief further examining the ideas put forth in their chapter for the SSDI Solutions Initiative about the need to modernize early intervention programs and other improvements to the way in which people enter into the SSDI program. You can read more about this brief and other work by the authors here. We hope that our project will continue to influence the debate in this country over how best to improve the programs for people with disabilities. To learn more, you can visit our website at http://www.SSDISolutions.org and purchase your own copy of SSDI Solutions: Ideas to Strengthen the Social Security Disability Insurance Program on Amazon. What’s the News in the 2016 Social Security Trustees Report? Don’t miss this opportunity for an in-depth explanation of the trustees’ projections of Social Security’s long-term finances. Attendees will hear from the Chief Actuary of the Social Security Administration, Stephen C. Goss, and other experts. Panelists will answer questions such as: Will benefits be adequate to meet retirees’ needs in the coming decades? Can we afford Social Security in the long term? What options do policymakers have to ensure that Social Security remains adequate and secure for the long term? Register here to get answers to your questions. Attendees will receive copies of the Academy’s new brief, Social Security Finances: Findings of the 2016 Trustees Report. The National Academy of Social Insurance is a nonprofit, nonpartisan organization made up of the nation's leading experts on social insurance. Its mission is to advance solutions to challenges facing the nation by increasing public understanding of how social insurance contributes to economic security. Visit www.nasi.org for more information on Social Security and other social insurance programs. Please join the Social Security Advisory Board at our Policy Forum on the Supplemental Security Income (SSI) Program on Tuesday, July 12th at the Carnegie Library - Mount Vernon Square, 801 K Street NW, Washington DC. We hope you will come to share your ideas as we explore important policy issues in the SSI program. The Board has published multiple reports and statements over several years regarding SSI and modifications that would better enable the program to achieve its objectives. We look forward to this discussion of the program, its rules and procedures, and its effect on the lives of millions of Americans, especially children. How do they compare with limits in other public benefit and tax systems? How (if at all) should they be updated over time? What do new ABLE accounts mean for SSI recipients and the program overall? What is it and why do we have it? How can these policies be simplified while maintaining basic program objectives? A look at how states fund child welfare programs and rely on federal financing. What happens to youth after they leave the SSI program? What can we do to improve those outcomes? We hope you will join us from 8:00 AM to 4:00 PM on the 12th. Register now and let us know any reasonable accommodations you may need. Space is limited, so registration is required for either the morning, the afternoon, or the full day. For more information, including a full agenda and presenter information (when available), visit our forum website or call 202-475-7700. This study identifies Social Security wealth as the accrued benefits based on past participation in the program. This definition is similar accrued pension wealth associated with defined benefit plans. The distributions of accrued Social Security benefits for the years 1985 to 2006 are derived from individual earnings record available in the Social Security Administration's 2006 Earnings Public Use File. The estimated accrued Social Security benefits are much more evenly distributed than are the estimates of savings wealth. Individuals in the top 10% of the estimated wealth distribution, excluding Social Security, held 70% of wealth as of 2006, but only 33% of accrued Social Security benefits. Once accrued Social Security benefits are included in a total wealth measure, the percent of the total attributable to the top 10% declines to between 55% and 62%. Click 1602 to view the paper in pdf format. Wonk Fight! Munnell vs CRFB on Social Security Myths. Over at MarketWatch, Boston College economist Alicia Munnell takes issue with the Committee for a Responsible Federal Budget’s “10 Myths” regarding Social Security reform. You’ll have to read them point-by-point to judge who comes out on top. And I hope the CFRB comes out with more thoughts, since it’s good to keep the discussion going. I love the Social Security program, believe it is the backbone of our retirement system, and would like to see 75-year financial balance restored. That said, budget people scare me when looking at Social Security. They see the 75-year shortfall as a simple mismatch of revenues and expenditures, want the gap closed, and many – not all – don’t care very much how that is done. My view is that Social Security will be the major source of income for most of the population, so cutting benefits, as opposed to putting in more revenues, would be a serious mistake. My time working on Social Security reform in the Bush Administration convinced me that Munnell’s point here has merit. Not the “don’t cut benefits” part – I’d still do that. But I think that fiscal conservatives too often look at Social Security as a budgetary problem to be solved while paying insufficient attention to how Social Security is functioning as a social insurance program for Americans. Yes, Social Security has to be solvent, but there’s more to a good Social Security program than simply not going broke. That’s why, once I joined the American Enterprise Institute, I stepped back a bit and thought about how I would want Social Security to work as a program, and not simply how would I make the current system solvent. That led to an approach that’s different than the system we currently have, but that has some important similarities to the pension systems in New Zealand, the U.K., Canada and Australia. You can read about plan that here. My thoughts on President Obama’s endorsement of Social Security expansion, over at Forbes.